Review Summary: Charlie Kay Chakkar Mein is no fun, despite some promising plot points. The film's opening credits have barely-dressed ladies crooning, 'Did Charlie do it?' and other such lines. For instance, non-linear narration, found-footage photography and inconsequential banter among the youngsters. Also too many characters make the plot convoluted. Drugs. Cops. Gangsters. Youngsters. Mix ‘em up, and you get ‘Charlie Ke Chakkar Mein’. Or at least that’s what the film sets out to do. As the whole country waits for Salman khan''s outing at the movies next week, no big filmmaker thought of taking a risk of releasing their movie this week. Thus, this surely is a bad day for the movie goers. Amongst all the small releases this week, there is debutant director Manish Shrivastav''s dark suspense comedy titled ''Charlie Kay Chakkar Mein'' starring the best of actors including Nasseruddin Shah, Anand Tiwari, Manasi Rachch and Amit Sial._x000D_ _x000D_ The movie is a journey of six friends Sam, Dips, Tanya, Patty, Nina and Jeeves, who are being blackmailed by a seductress, Hera to do a cocaine delivery job. However, in the process of the same, all six loose their lives. The case is now being investigated by Comissioner of Police, Sanket Pujari (Nasseruddin Shah), who struggles to decipher a rare case of multiple homicide. Sohail, an eyewitness too is in pickle as to who the actual murderer is._x000D_ _x000D_ How will Sanket manage to solve this intriuging case? Forms the rest of the story..._x000D_ _x000D_ Even though the movie possesses the best of talent from the industry, performance wise, it has nothing to offer. Naseeruddin Shah''s character demands him to be largerthan-life and he does that perfectly. Anand Tiwari, who is otherwise quite good, displays various shades in the movie. But his character is so badly written that the actor cannot do much. He only delivers dialogue without any expressions. Amit Sail, again, gets minimum exposure and fails to impress us._x000D_ _x000D_ Talking about the story of the film will be useless as there is no story as such. The whole movie is merely a bad amalgamation of scenes that do not make sense and no one sequence is a continuation of the previous. The editing is pathetic and so are the songs, which do not go with the plot. There are only two to three dialogues in the name of comedy, which are again not funny in any sense of the world._x000D_ _x000D_ On a whole, Charlie Kay Chakkar Mein can give you chakkar. Avoid it and wait for Salman to rock your world next week. On a whole, Charlie Kay Chakkar Mein can give you major headache. Miss this one and wait for Salman to give you the real fun. Watch it if you are a fan of the dark deed films but mostly you can watch it for Naseeruddin Shah. Screenplay and dialogues could have been better. Background score by Manish J. Tipu suits the scenes, but as the intensity lacks in those scenes, even his music appear to be a flaw. Finally, Manish Srivastav could not live up to the expectations of the thriller lovers. If only that sheet made it to the sets during filming, this would've been an entirely different film. 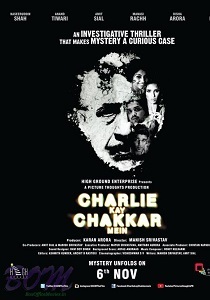 If you are keen to watch a thriller this weekend, then Charlie Kay Chakkar Mein won’t disappoint. Naseeruddin Shah’s performance is the film’s highlight. Also, watch it to find out what Charlie really means. Overall, with its narration going in circles, this film fails to engross viewers. A thriller that keeps you hooked till the end.